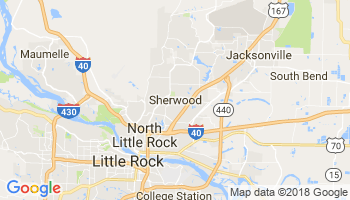 Sherwood, Arkansas qualifies as one of the state’s newer towns having been incorporated on April 22, 1948. Families began settling in the area in the early 1900s creating a small farming community with no utilities. Running water made its debut in 1923 and electricity became available in 1925. The town continued to grow until its incorporation. July 10, 1948 brought the first citywide election and the inaugural mayor, recorder, and city council were elected. Five hundred and twenty five dollars was raised with an additional $75 being added from a bingo game and beverage sales. The total $600 became the first Sherwood Improvement Fund. Methamphetamine, cocaine, and heroin abuse continues to spread in Pulaski County, Arkansas, consequently effecting crime-rate: this district has the “2nd highest rate of total crime index offenses,” and the “2nd highest rate of violent crime” in the state (AFMC). Large funding and recourses have gone into local police departments to investigate and crack down on drug related crimes. According to Drew Petrimoulx, of arkansasmatters.com, so far this year, Arkansas police have confiscated 34 lbs of Heroin. Moreover, in 2016, the number of drug overdose deaths in the state, increased by seventeen percent at 335 fatalities—Pulaski County made up the bulk, with 77 drug-induced deaths that year alone. Furthermore, alcohol-related incidences has increased—the Robert Wood Johnson Foundation’s (2017) health-data, reports that excessive drinking in Pulaski Country is parallel to the entire state at 15%, while the overall US is at 12%. As a result, 33% of driving deaths in the county were from alcohol-consumption; whereas, the rest of Arkansas reported 28% of alcohol-impaired driving deaths, and the US calculated approximately 13%. Due to the amplitude of drug-abuse, more rehabs have opened, allowing affordable programs and counseling for those seeking support. There are currently about 55 alcohol and drug rehabs within Pulaski County. Each program provides contact information to speak with a treatment specialist; from there, specific questions can be answered about the following recovery-steps: assessment, detox, intake, inpatient and outpatient treatment, aftercare, and sober living— that is, if these concerns aren’t already addressed and answered below. Reportedly, methamphetamine, cocaine, heroin and excessive-alcohol consumption makes up the most prevalent addictions within Sherwood, Arkansas and surrounding areas. With any of these addictions, a rehab assessment will proceed before taking in a patient (usually with questionnaires, self-assessments and/or a physical exam). This allows the evaluator(s) to determine whether an addiction is fully present, to what extent, whether or not it pairs with co-occurring condition(s), and how to treat the specific, individual. Usually doctors, nurses, social workers, and therapists carry out these assessments. Arkansas’, “55 alcohol and drug rehabs within Pulaski County,” mentions that Professional Counseling Associates Sherwood Clinic (7800 Highway 107, Sherwood, AR 72120), accepts all ages and does a full assessment, which will help with under-lying psychological-factors—for example, a person who suffers from Obsessive Compulsive Disorder, and disruptive rumination, may turn to alcohol or drug consumption to numb racing thoughts. However, in this example, it could just as well be depression or trauma that’s initiating reckless behavior; the point is to understand and improve potential causes of the addiction. Since the bulk of therapists specialize in many areas, it makes getting to the root of the problem easier and indeed quicker. Thus, after the assessment, the program can efficiently and accurately accommodate the patient. Before rehab begins, the patient must detox. Certain rehab groups and programs will not accept members until they’re fully clean; and depending on the drug used, it may take the body five to ten days to rid of toxins. Fortunately, most treatment centers have medically supervised detox programs, which allows those with severe-addictions to withdraw safely and comfortably. Although detox might cause the patient to stop their addiction in the short-term (due to intense physical and emotional withdrawal-symptoms), unless follow-up care and therapy takes place, the risk of relapse increases immensely. Therefore, detox is just one of the essential steps in full recovery. This service benefits especially those forced to get help through intervention, or individuals who received court-orders—having safe assistance is key for those not particularly wanting aid. Whether the patient detoxes by themselves before entering a program, or through guided assistance in a center, it’s a significant step in progressing towards recovery. Usually, during the intake process, the patient will meet with a counselor or therapist, a doctor, and/or a psychologist. Basically, this one-on-one time is part of an interview process, which establishes the substance abuse treatment program that will most benefit the patient. Documented notes, describing medical and mental health history will be reviewed from the session, and specialized screenings and physical exams might also take place. During this process, the patient will also be asked about major events or certain instances that might have led to the eventual addiction. Furthermore, this step typically involves some form of payment and/or a financial plan, and luckily, many facilities offer a number of payment and insurance options. For instance, a local rehab for women and female patients, gathers individual-background history, in order to give an accurate dual-diagnosis. Their intake process indicates whether a patient needs Cognitive Behavioral Therapy (CBT), Co-Occurring Disorders Treatment, or Smart Recovery, and so forth. Everything remains confidential, so the patient can feel safe when sharing closely personal information. This step is necessary, because although the majority may have a drinking, or methamphetamine problem, some may struggle with PTSD, anxiety, depression, or so forth, and therefore need relatable and appropriate groups and therapy sessions. Differing in severity and length, plans include: residential treatment centers (RTC), partial hospitalization drug rehab programs (PHP), and intensive outpatient programs for substance abuse (IOP). Highly structured, and evidence-based, RTC programs typically follow the 12-step model of recovery (Alcoholics Anonymous), and holds emotional process groups, helps with planning for work-return, etc (depending on facility). This center is for individuals who have recently received hospital-care, or who need more structure, and stability than outpatient care. Average length of stay is typically three to six months, and is usually all residential-based (no returning home each night). PHP, also referred to as “day rehab,” provides the patient with the intensity of RTC, but allows the patient to spend evenings at home. Using many of the same tools and resources, PHP can be just as effective. Six hours per day, for five days a week, individuals receive therapy, counseling, and tools. Many drug and alcohol rehab centers now offer this style of treatment, likely due to affordable recovery options and less financial burdens with health and medical insurances. Likewise, IOP has many of the same services, but goes for three hours a day, three days a week. Similar to PHP, this option suits those who’ve completed an inpatient program, like RTC, or for individuals that require an outpatient setting (due to professional or personal reasons). Typically, IOP focuses on group therapy, while using one-on-one counseling less often. Length of attendance differs from person to person, depending on their emotional and psychological progress, and well-being. Again, drugrehab.org, lists a tremendous amount of rehabs in Pulaski County, that offers all three treatment-programs. Pulaski County has numerous rehabs providing extensive services and resources, making recovery more readily available. Immediate, and continuous follow-up treatment for substance abuse, should occur after the completion of an initial rehab program. Addiction aftercare programs aim to encourage recovery maintenance, and helps develop ways to prevent relapse, to achieve a fulfilled life with healthy relationships and a sense of purpose. Continuing treatment is extremely important, especially because longstanding substance abuse can de-normalize cognitive-function and altar parts of the brain long after rehab. Beyond physical impact, several long-term psychological changes may affect thoughts, feelings, and behaviors, induced by the original substance-intake. Therefore, it’s clear that aftercare must be utilized. There’s plenty of supportive check-ups available with health professionals throughout the county. Another idea to consider is living in a sober living home— a group home for addicts, that allows one to come and go as they please, as long as they follow curfew-rules and do chores. Residents in these places must remain sober, and supportive. Thus, this environment encourages sobriety and helps addicts adjust to a non-substance/non-alcoholic life. Many sober living homes include volunteer opportunities and therapeutic meetings, such as feeding the homeless at soup kitchens, as well as, Alcoholic-Anonymous (12-Step) meetings, and job-search tools. Before moving in, each individual must complete the detox process. Not every recovering-addict needs to move into a sober living home, but, like the above resources and programs listed, it’s worth considering. Many members agree that there’s strength in numbers, when trying to get help; and it’s comforting to know that most other members can relate, as they too suffered from addiction. Still, if a patient recovered with a different program, and can confidently live on their own without feeling the urge to take drugs or drink, than that’s great too. Although the road to recovery differs from person to person, the main point is that the sufferer is getting help, and beginning the process of living a healthier, safer, and sober lifestyle.